Indoor composting has never been simpler! Cut your scraps into small pieces are placed into the Urban Composter. All types of food scraps can be composted including: Meat, Fish, Vegetables, Fruit, Dairy, Coffee, Wilted Flowers (no bones or excessive liquids). Compost Accelerator spray is applied to the scraps. This organic spray breaks down and ferments the organic waste in the bucket, which and means no nasty odors during fermentation. The convenient spray bottle is easy to store and refill. The Urban Composter City is a compact bokashi solution for smaller homes and apartments. It's a mighty bokashi bucket in compact form, holding a very respectable 1.6 gallons of kitchen scraps. Made for use with Urban Composter’s specially formulated Compost Accelerator spray, the Urban Composter City is convenient and easy to use. The Urban Composter City comes in your choice of four lid colours: Lime (Green), Chili (Red), Berry (Purple) and Black. Urban Composter™ is the quick and easy way to create compost from your kitchen waste. For years people have been searching for a simple and convenient kitchen compost bin. Stylish, clean and effective – The Urban Composter™ is a kitchen bench-top composting system that turns your unwanted peels, off-cuts and leftovers into nutrient-rich fertilizer for your garden. The Urban Composter™ is a revolutionary compost container that doesn’t just hold your kitchen scraps en-route to the compost heap, but actually starts the composting process right in your kitchen without any bad smells. It feels good knowing that the bits of food I don’t use in my cooking are being put back into the garden and not being wasted. Just discovered your alternative to bokashi bran – I gave up the bokashi – having a box of bran plus the bin took up too much space. This looks like just the thing to get me back into it! I am absolutely smitten with the Urban Composter… It’s awesome that they now come in two sizes, perfect for someone living in an apartment. The Urban Composter Bucket is a stylish kitchen compost bin that looks great on the counter top in any kitchen, holding 6 gallons of organic kitchen scraps. 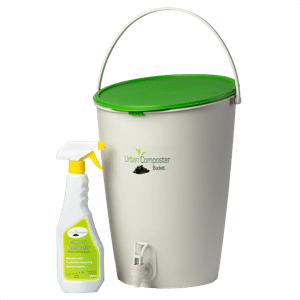 Made for use with Urban Composter’s bokashi Compost Accelerator spray, the Urban Composter Bucket is completely air tight. Moulded in light grey with a spigot and comes with your choice of 4 different lid colors.